ST. PAUL, Minn. – The No. 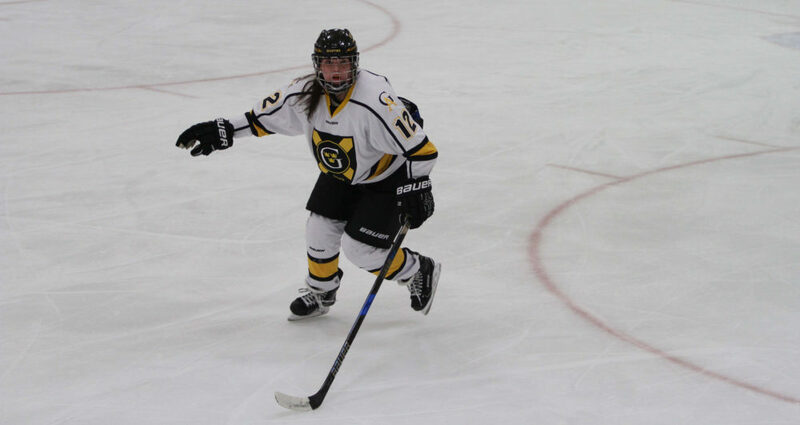 7 Gustavus women’s hockey team was upset 5-2 Friday night at Hamline University, dropping its first game of the season to move to 3-1-1 overall and 2-1 in the Minnesota Intercollegiate Athletic Conference. Hamline scored 6:38 into the game and never trailed, holding a 1-0 lead after the first period. The Pipers went on a scoring spree in the second period with four goals for a commanding 5-0 lead after two periods. The Gusties ended the shutout at the 5:58 mark of the third period on a power play goal by Kristen Cash (So., Roseville, Minn.), assisted by Kaitlyn Klein (Sr., Plymouth, Minn.) and Erica Power (Sr., Lakeville, Minn.). Erin Moes (Jr., Hastings, Minn.) scored another power play goal, assisted by Katy Fuller (Sr., Minneapolis, Minn.) and Diana Draayer (Sr., Deephaven, Minn.), with three minutes remaining in the game, but the Pipers had already done the damage to secure the win. Amada DiNella (Jr., Oakbrook Terrace, Ill.) suffered the loss in net after allowing all five goals in 40 minutes of action with 26 saves. Paige Press (Jr., Cottage Grove, Minn.) completed the final 20 minutes of the game and made five saves without surrendering a goal. The outcome marks the first Gustavus loss to Hamline in the all-time series, which Gustavus now leads 35-1-1 dating back to 2001. The Gusties and Pipers complete the regular season series at 2 p.m. tomorrow at Don Roberts Ice Rink.